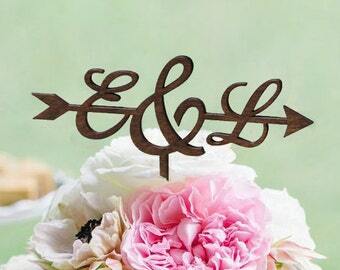 Beautiful Rustic Arrow Cake Topper With Your Initials. The rustic cake topper is made of 1/8" plywood (laser cut) - unfinished wood ( Natural Birch Wood Color - example "C "heart" L" ) or stained wood (both sides are stained, example "H "heart" K" ) on your choice. 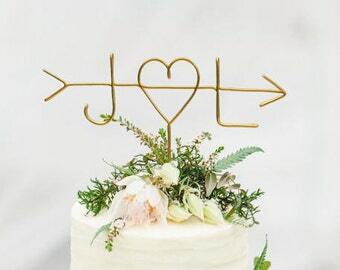 You can choose the size of your cake topper (the width) in the drop down menu. Please write in Note section your initials, for example: " N <3 R"
Items are shipped 2-3 weeks after order and payment are received. Shipping takes up to 5 days in the US, about 2 weeks to Canada, Australia, Europe... and shipping to other country takes up to 5 weeks. If you need your order immediately - just let us know - we'll try to find a way to ship it faster! (using Express Mail - can be extra charge). Fast shipping, turned out great! Such a great piece! The product came securely packaged and perfectly as ordered. 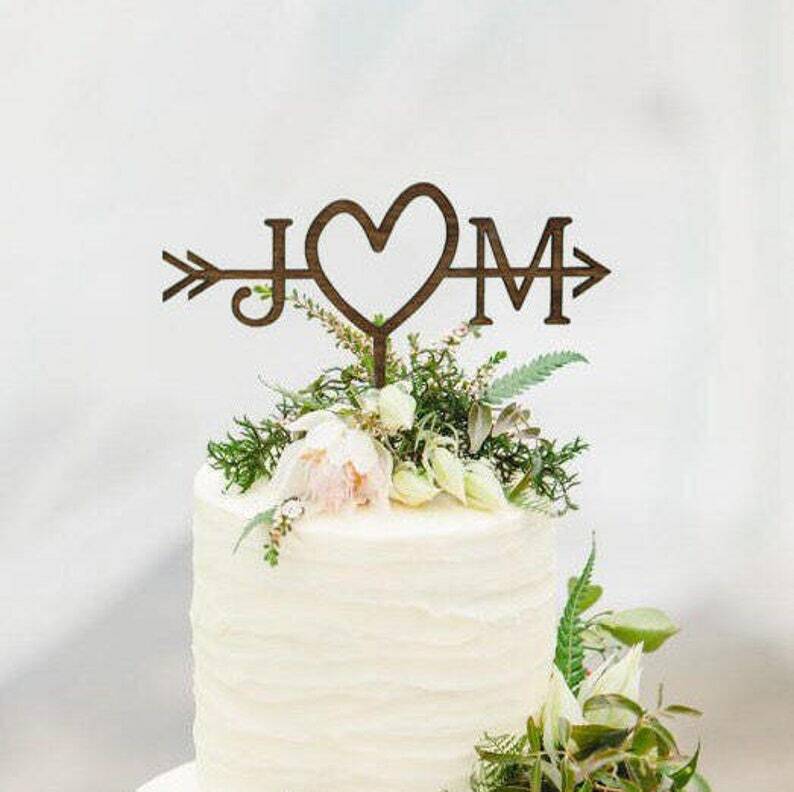 Can't wait to have this displayed on our cake at our wedding. 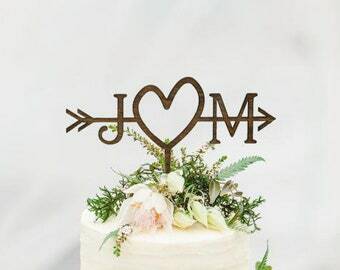 This is something that can also be used in general home decor (like in a flower vase) once the wedding festivities are over. I highly recommend! 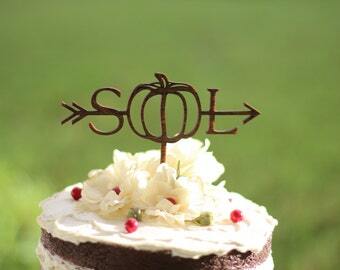 Super cute and we'll packaged!! !!! International customers!!! may have to pay applicable sales tax, duties and customs charges which are determined by your local government and vary by country. We have no control over these and no way of predicting them. Contact your local Customs office if you have any questions or concerns about these fees. Customs fees or taxes are separate from the shipping charges, and they are not our responsibility. Due to the nature of the handmade item, custom made item is not refundable and cannot be returned. If for any reason you’re not pleased with the purchase, you may just simply return it . If you would like to request a refund or exchange, please contact me within 2 days of receiving the item. After 2 days the item is not refundable. The product should be in its original condition. Once I receive the item back, I will issue a refund. Also, you are responsible for the cost of shipping the item back to me. Total Return Costs: Customer pays postage fee to return the item back and 30% restocking fee will apply. Also the cost of original shipping label (which was used to ship the item to the customer) and RUSH fee are not refundable. Items are shipped in 2-3 weeks after order and payment are received. I use USPS for delivery! Shipping to other country takes up to 5 weeks. If you've received the broken item - please contact me within 2 days of receiving it. Please attach the photo of broken product and wait for confirmation from me that I receive it. Cancellation for NOT CUSTOM MADE ITEM is acceptable, but 30% restocking fee will apply. So after that period of time order can be canceled, but 70% restocking fee will apply. For custom made orders, please add all information to note section of the order(you can find it while checkout) or message me once the order is made.